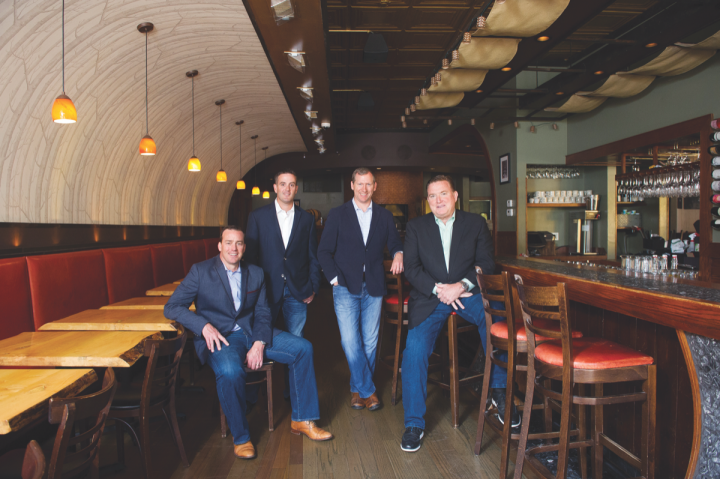 4 Star Restaurant group owners Doug Dunlay, Josh Rutherford, Derek Rettell, and Michael Dunlay operate 12 restaurants across Chicago. In the 15 years that 4 Star Restaurant Group has been in operation in Chicago, the company has never closed a restaurant. That’s a feat to be celebrated in a crowded and competitive on-premise market like the Windy City, and it’s one that isn’t lost on 4 Star’s executive team. 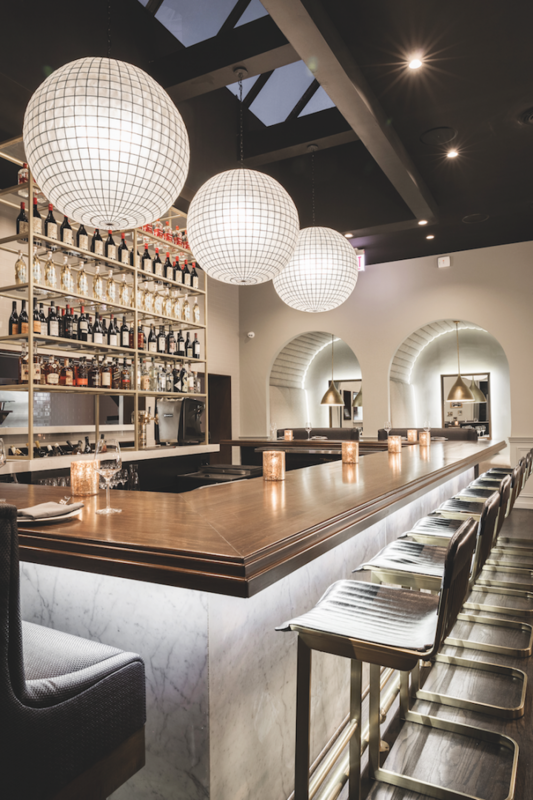 Launched by cousins Doug and Michael Dunlay in 2003 with the debut of the American grill Dunlays on Clark in Chicago’s Lincoln Park neighborhood, 4 Star now operates nine concepts and manages 11 venues overall, with a 12th set to open this spring. Revenues topped $30 million for 4 Star Restaurant Group in 2017, with beverage alcohol comprising between 35% and 40% of total sales. 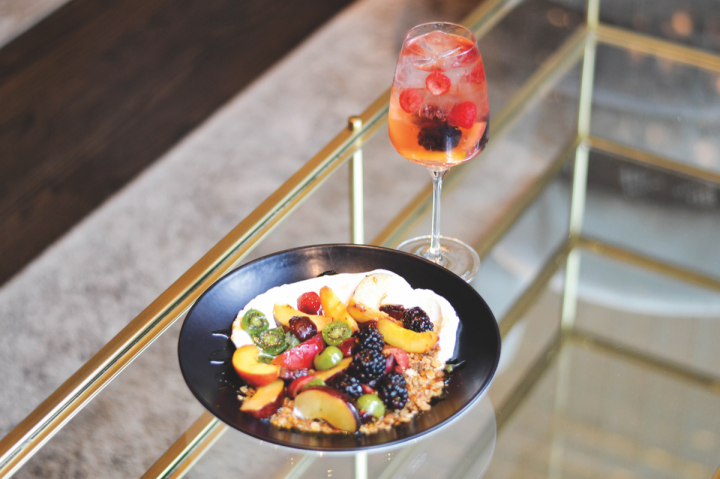 Wine is a category leader, as 4 Star operates two wine bars, a pizza and wine venue, and an elevated dinner concept, though spirits and beer also hold considerable shares of the drinks business. The company emphasizes hospitality and caters to Chicago locals, who laud 4 Star’s restaurants for their upscale, approachable atmospheres. The Dunlay cousins brought in Rutherford and Derek Rettell—both longtime restaurant industry professionals—early on, and together the foursome has built a formidable on-premise business in Chicago. Modern American fare shines in venues like Remington’s and The Windsor, while global cuisine is highlighted at the upscale Ella Elli, and Tex-Mex takes center stage at Tuco and Blondie. Along with these, 4 Star operates the barbecue venue Smoke Daddy; the comfort food-focused Crosby’s Kitchen; the bar and grill concepts Dunlays On Clark and Dunlays On The Square; the pizzeria wine bar Frasca; and two units of bistro D.O.C. Wine Bar. A second Smoke Daddy will open this spring in the new Hotel Zachary near Wrigley Field. The globally focused Ella Elli is 4 Star’s most upscale venue. 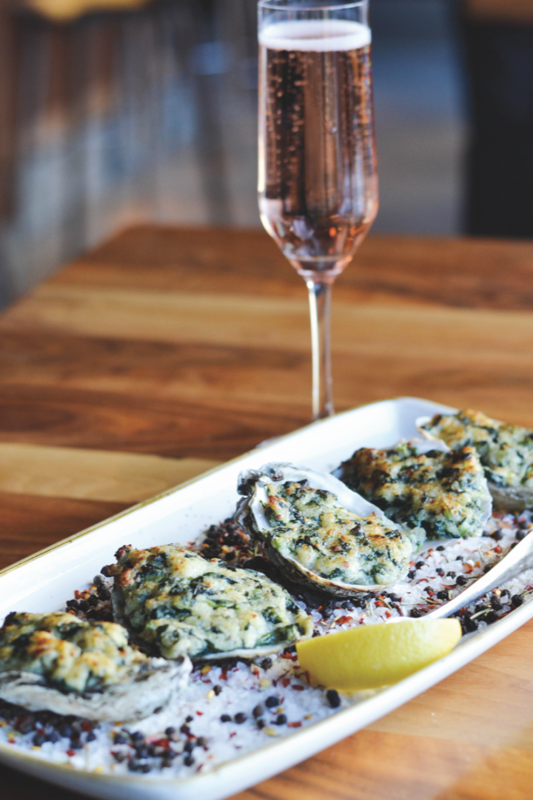 Located in Lakeview, Ella Elli’s menu includes charcuterie and toasts, pizza and pasta, and seafood and meat dishes. Standouts include Mediterranean sea bass with blistered cherry tomatoes, garlic, and chilis; and lamb scottadito with herbed yogurt and harissa (entrées range from $12-$29). Ella Elli’s beverage program is equally international. Cocktails ($12) include the Pom Spritz, made with Francesc Ricart Brut Cava, Solerno Blood Orange liqueur, house-made tarragon syrup, and pomegranate juice, and the Mezcal Penicillina, comprising Montelobos mezcal, Barrow’s Intense Ginger liqueur, house-made grapefruit cordial, and lime juice. These are joined by local craft beers and international brews ($6-$12), as well as roughly 40 wine labels ($7-$11 a 3-ounce glass; $10-$18 a 6-ounce glass; $40-$112 a 750-ml.). At modern American venue Remington's, seafood (oyster dish pictured) and steak are the main attractions. Mexican-inspired Tuco and Blondie is another departure from 4 Star’s traditional American grill format. The Southport Corridor venue serves Tex-Mex fare and does a robust Margarita business, selling more than 100 Margaritas a day. Food ranges from Yucatán crispy pork ribs to fajitas, tacos, and enchiladas (entrées are $12-$24), and the restaurant lists seven Margarita varieties. Tuco and Blondie’s Classic Margarita is made with Piedra Azul Reposado Tequila, Bols Triple Sec liqueur, lime juice, and agave syrup, while the Cadillac version comprises Don Julio Reposado Tequila, Cointreau and Grand Marnier Cordon Rouge liqueurs, lime juice, and agave syrup. The venue’s other cocktails include a Michelada, a Paloma, and signature creations (cocktails are $7-$14). Mexican beers and sipping mezcals and Tequilas also have a place on the menu. Ella Elli is globally focused, with its food and drinks menus taking inspiration from a variety of cultures. The restaurant has both brunch (greek yogurt dish and cocktail pictured) and dinner services. The American grill Dunlays On Clark in Lincoln Park celebrates its 15th anniversary this year. The venue’s signature dishes include mac and cheese, Seattle-style barbecue salmon, and chicken pot pie, which are joined by a variety of burgers, grilled pizzas, and snacks (entrées are $10-$27). Wine is a highlight and 4 Star emphasizes affordability, offering approachable labels like Catena Chardonnay, Angeline Pinot Noir, and Matanzas Creek Merlot (wines are $8-$13 a glass and $30-$72 a 750-ml.). Dunlays On The Square in Logan Square has a similar menu. “All of our restaurants offer great value wines,” Rutherford says. “We want people to feel comfortable coming in and ordering whatever they’re interested in.” Burger, who started with 4 Star Restaurant Group ten years ago as a sommelier, adds that all of the company’s restaurants have good wine selections and that the venues emphasize education, offering guests free sample pours of many labels and wine flights in some locations. “Our by-the-glass program is very important,” Burger says, noting that the restaurants have global lists, with varietal staples like Pinot Noir, Sauvignon Blanc, and Malbec alongside lesser-known wines like Grüner Veltliner and Vermentino. 4 Star also has a private label, Dunzin Dry Creek Valley Zinfandel, at all of its locations ($11 a glass; $42 a 750-ml. at Dunlays on Clark). With units in Lincoln Park and the suburb Lombard, D.O.C. Wine Bar showcases 4 Star’s most expansive wine program. The venues offer 35 glass pours ($9-$22) and more than 200 bottles ($36-$304 a 750-ml. ), as well as seasonal flights ($19-$29 for three 2-ounce pours) like the recently listed Jupiter, which includes pours of the 2010 Château Larose-Trintaudon Haut-Médoc, the 2015 Quilt Cabernet Sauvignon, and the 2013 The Paring red blend. Though wine is the drinks focus, the bars also list several specialty cocktails ($8-$12), beers ($6-$9 a bottle), and whiskies ($9-$31 a 2-ounce pour). D.O.C. Wine Bar’s food menu is designed for pairing and includes a variety of sliders, flatbreads, paninis, and larger dishes like fish tacos and rigatoni with sausage (food ranges from $5-$32). 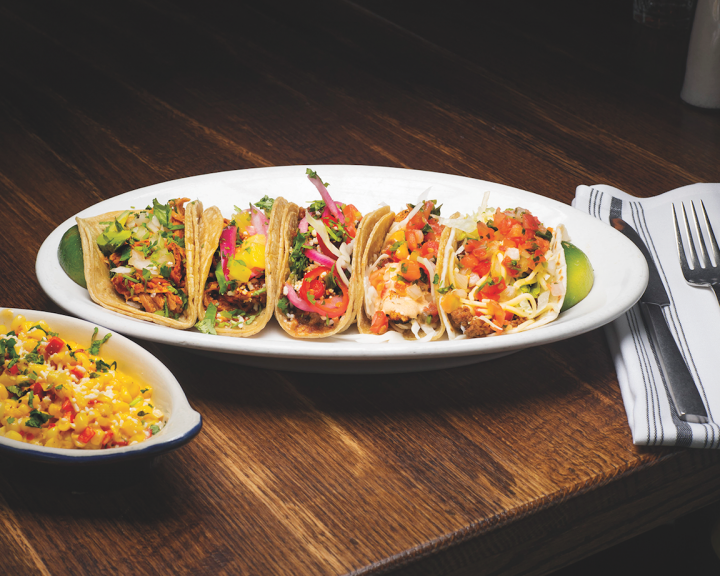 4 Star's on-premise portfolio includes the Mexican-inspired Tuco and Blondie (tacos pictured), which is a departure from its traditional American grill format. Frasca Pizzeria & Wine Bar has a similar drinks focus. Highlighting European wines, the Roscoe Village venue lists roughly 50 wine labels ($9-$16 a glass; $32-$110 a 750-ml.) alongside a handful of craft beers ($5-$9 a draft pour, can, or bottle) and cocktails ($10-$12). Frasca’s menu includes pizzas and pastas ($10-$21), with standouts like the Rustica wood-fired pizza, topped with prosciutto, oven-dried tomato, basil pesto, provolone, and mozzarella, and the Rigatoni Gigante, a pasta dish made with fennel sausage, sweet peas, and a tomato cream sauce. Each of 4 Star’s concepts has its own distinct menu and there’s not much overlap among food or drinks items, with the exception of a few company signatures that are found on multiple menus. The Wrightwood Salad, for example—topped with rotisserie chicken, tomatoes, dried cranberries, avocado, goat cheese, corn, almonds, and citrus vinaigrette ($13 at Crosby’s Kitchen)—is offered at several 4 Star restaurants, as are Spaetzle Mac ’N’ Cheese, made with fontina béchamel and bacon ($10 at Remington’s), and Mini Filet Sandwiches, served with blue cheese, candied red onions, and truffled mayonnaise ($15 at Dunlays on The Square). The company’s barbecue concept, Smoke Daddy, is poised for expansion this year, with a second unit set to open this spring in the new Hotel Zachary by Wrigley Field. Its debut will mark 4 Star’s 12th Windy City venue overall. Smoke Daddy offers ribs ($14-$29), meat platters ($13-25), and sandwiches ($9-$11), from sliced brisket to pulled pork. Beer gets a lot of attention here and Smoke Daddy lists 14 draft selections, including labels from locally brewed Lagunitas, Two Brothers, and Off Color (beers are $5-$8 a draft pour, can, or bottle). 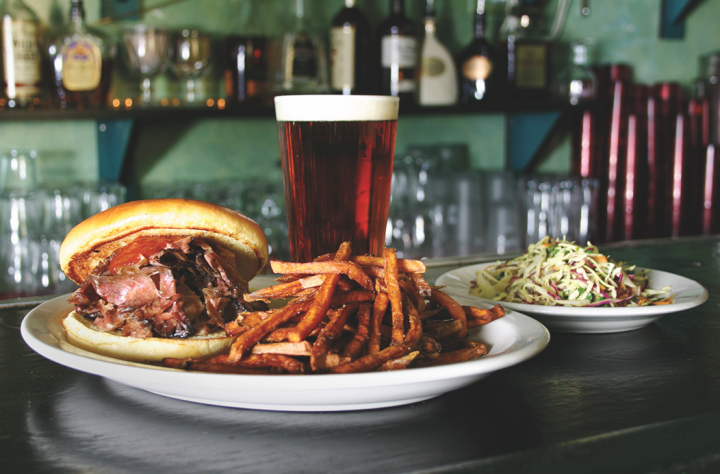 4 Star's barbecue concept Smoke Daddy (smoked sliced brisket sandwich and beer pictured) is opening its second outpost in the Hotel Zachary near Wrigley Field this spring.